"Capital city dwelling values were 1.1 per cent higher over the three months ending July, taking the aggregate capital gain to 5.0 per cent for the year to date across the combined capital cities. The gain was mostly centred in Sydney, Melbourne and Canberra where dwelling values rose 2.0 per cent, 1.8 per cent and 2.1 per cent respectively over the rolling quarter to offset the falls recorded in other capital cities. The Darwin market also recorded a capital gain over the past three months (+0.8%) while the remaining capital cities all recorded a drop in values (Brisbane -0.4%, Adelaide -2.6%, Perth -0.1%, Hobart - 1.2%)." 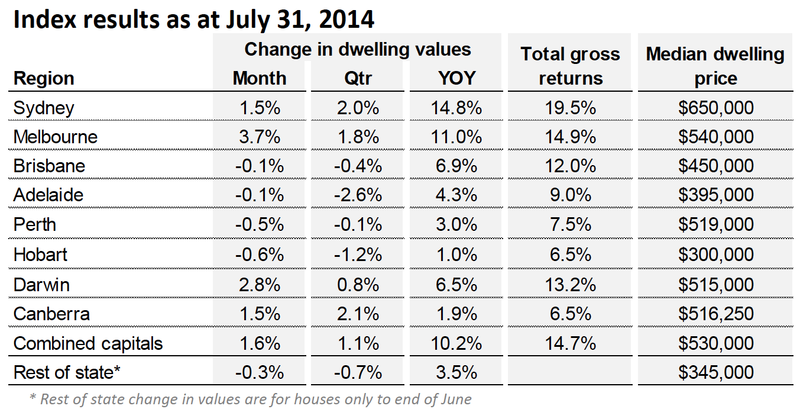 However, looking at the breakdown of the statistics, Brisbane apartments are doing much better than Brisbane houses.